Airport: 45 km., Railway Station: 17 km. Hotel Holiday Inn Resort is lcoated right on the Mobor Beach in South Goa. 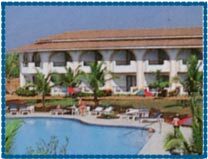 Holiday Inn Resort Goa is one of the finest 5 Star Resort in Goa and is located on a virgin beach of Mobor ib South Goa. 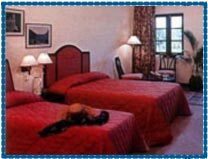 Situated in the vast landscaped property of 26 acre the hotel is like a beautiful mirage in Goa. The prime beach that is part of the hotel is one of the most important attraction in Goa. This kind of property is one of the most sought after because of the beach as it offers a great opportunity to watch the beautiful arabian sea at its romantic best in the night. Hotel offer a total of 170 rooms and suites that have been categorized into sea, garden and pool facing rooms. Out of these rooms and suite one of a very special case is that of Kids room that have been specially made for families with kids. Treasure Island theme have been implemented with great perfection for having something for the kids in the room. Centrally Air-conditioned, Well Appointed Work Desk and Seating Arrangements, Mini Bar, Tea / Coffee Makers, Luxurious Bathrooms with Bath Tub, Hair Dryers, Wardrobe, Direct Dialing Facility, Colour Television with Live Satellite Entertainment & News Transmission.